1 Core and dice the apples, slice the celery, chop the lettuce and place in a bowl with the grapes. 2 Mix the mayonnaise with the juice from the lemon in a bowl. 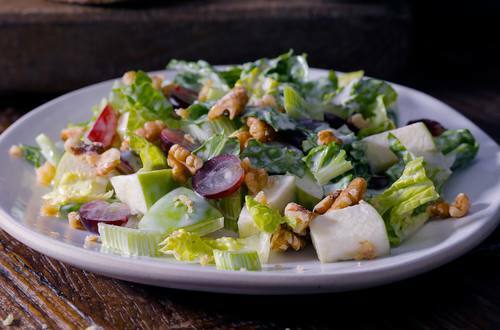 3 Stir in the mayonnaise, mix into the salad and decorate with the toasted walnuts. Best accompanied with crusty bread as a starter or a side dish.